ANN ARBOR, Mich., Nov. 08, 2017 (GLOBE NEWSWIRE) -- Arotech Corporation (Nasdaq:ARTX) today announced financial results for the quarter and nine months ended September 30, 2017. The Training and Simulation Division received a $5.8 million award for its weapon simulation based launch zone solutions for a new application. The U.S. Army National Guard followed last quarter’s $10.5 million sole source contract with additional contracts in the third quarter. The new awards provide a training system for the New Jersey Guard ($1.6 million) and a five year contract worth up to $4.8 million to allow Arotech to provide continued field support for all of the simulators Arotech has fielded to the Army National Guard. The Training and Simulation Division received $4.4 million in awards from Arotech’s Department of State IDIQ, which was comprised of $1.7 million of use-of-force training systems and $2.7 million of police pursuit driving simulators. Arotech’s U.S. power division received $3.7 million in GREENS orders in the third quarter. Total company backlog increased in the third quarter to $69.5 million compared to $55.0 million for the same period last year and $61.3 million at the end of the second quarter 2017. “Our Power Systems Division continues to make excellent progress on our Distributed Power Control and Monitoring System (DPCMS) program. We received $2.8 million in new awards in the third quarter, which includes expected Low Rate Initial Production awards as well as a new development contract for the C7 variant of the Amphibious Assault Vehicle (AAVC7),” concluded Mr. Krutty. Revenues for the third quarter of 2017 were $25.9 million, compared to $24.3 million for the corresponding period in 2016, an increase of 7%. The year-over-year increase was due primarily to higher revenue in our Use of Force (Milo) and our Air Warfare Simulation product areas. Gross profit for the third quarter of 2017 was $7.3 million, or 28.0% of revenues, compared to $7.9 million, or 32.4% of revenues, for the corresponding period in 2016. Operating expenses from continuing operations were $6.0 million or 23.1% of revenues in the third quarter of 2017 compared to expenses of $6.0 million or 24.8% of revenues for the corresponding period in 2016. Operating income for the third quarter was $1.3 million compared to income of $1.8 million for the corresponding period in 2016. Arotech’s net income from continuing operations for the third quarter of 2017 was $788,000, or $0.03 per basic and diluted share, compared to a net income of $1.5 million, or $0.06 per basic and diluted share, for the corresponding period in 2016. Adjusted Earnings per Share (Adjusted EPS) for the third quarter of 2017 was $0.06, compared to $0.10 for the corresponding period in 2016. Adjusted Earnings Before Interest, Taxes, Depreciation and Amortization (Adjusted EBITDA) for the third quarter of 2017 was $2.3 million, compared to $3.1 million for the corresponding period of 2016. Revenues for the first nine months of 2017 were $69.7 million, compared to $71.5 million for the comparable period in 2016, a decrease of 2%. The year-over-year decrease was due primarily to the timing of contract awards in our Vehicle Simulation product area. Gross profit for the first nine months of 2017 was $19.7 million, or 28.3% of revenues, compared to $22.6 million, or 31.5% of revenues, for the prior year period. Operating expenses from continuing operations for the first nine months of 2017 were $18.8 million or 26.9% of revenues, compared to expenses of $20.6 million or 28.8% of revenues for the corresponding period in 2016. Operating income for the first nine months of 2017 was $934,000, compared to operating income of $2.0 million for the corresponding period in 2016. Arotech’s net loss from continuing operations for the first nine months of 2017 was $(575,000), or $(0.02) per basic and diluted share, compared to a net income of $554,000, or $0.02 per basic and diluted share, for the corresponding period in 2016. Adjusted Earnings per Share (Adjusted EPS) for the first nine months of 2017 was $0.09, compared to $0.16 for the corresponding period in 2016. Adjusted Earnings Before Interest, Taxes, Depreciation and Amortization (Adjusted EBITDA) for the first nine months of 2017 was $4.4 million compared to $6.3 million for the corresponding period of 2016. As of September 30, 2017, Arotech had $4.7 million in cash and cash equivalents, as compared to December 31, 2016, when Arotech had $7.4 million in cash and cash equivalents. As of September 30, 2017, Arotech had total debt of $14.5 million, consisting of $3.1 million in short-term bank debt under its credit facility and $11.4 million in long-term loans. This is in comparison to December 31, 2016, when Arotech had total debt of $13.5 million, consisting of $3.0 million in short-term bank debt under its credit facility and $10.5 million in long-term loans. The increase in long term loans was due to the purchase of land and a building previously leased by our Training and Simulation Division. Arotech also had $8.5 million in available, unused bank lines of credit with its primary bank as of September 30, 2017, under a $15.0 million revolving credit facility and a $10.0 million term loan and a $3.1 million mortgage that are secured by the assets of Arotech and Arotech’s U.S. subsidiaries. Arotech had a current ratio (current assets/current liabilities) of 2.2, compared with the December 31, 2016 current ratio of 2.0. As of December 31, 2016, Arotech had net operating loss carryforwards for U.S. federal income tax purposes of $46.9 million, which are available to offset future taxable income, if any, expiring in 2021 through 2032. Utilization of U.S. net operating losses is subject to annual limitations due to provisions of the Internal Revenue Code of 1986 and similar state provisions. Arotech accrued $263,000 in non-cash tax expenses in the third quarter of 2017, reflecting the uncertainty of the deductibility of intangible expenses for federal income tax purposes. Arotech had a backlog as of September 30, 2017 of $69.5 million. This compares to a backlog of $55.0 million for the same period last year and a backlog of $55.4 million as of December 31, 2016. 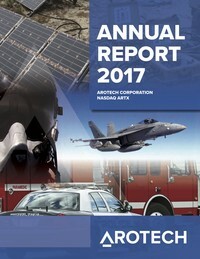 Arotech has narrowed the 2017 outlook for total revenue to a range of $95 to $100 million, with a reduced adjusted earnings per share (Adjusted EPS) range of $0.16 to $0.20, and a corresponding reduced adjusted EBITDA range of $7.0 million to $7.5 million. The financial guidance provided is as of today and Arotech undertakes no obligation to update its estimates in the future. Arotech will host a conference call tomorrow, Thursday, November 9, 2017 at 9:00 a.m. Eastern Time, to review Arotech’s financial results and business outlook. The online playback of the conference call will be archived on Arotech’s website for at least 90 days and a telephonic playback of the conference call will also be available by calling 1-877-481-4010 within the U.S. and 1-919-882-2331 internationally. The telephonic playback will be available beginning at 12:00 p.m. Eastern time on Thursday, November 9, 2017, and continue through 9:00 a.m. Eastern time on Thursday, November 16, 2017. The replay passcode: 21455.